I need to be honest up front - my first reaction on seeing this book was 'Let someone else review it.' I have zero interest in football, and don't understand why anyone cares about such a dull activity. But then it struck me that what better test could a book have than being tried out by someone without an interest in the theme, and I'm glad I stuck with it, because I really enjoyed it despite myself. This is because David Sumpter may be using soccer as a hook for mathematical explorations, but the book is far more about the maths than the anything-but-beautiful game. So, for instance, the first chapter begins with the distribution of football results during a season, but quickly expands from that to explore the Poisson distribution and its much wider applications. If it weren't for the deeply irritating introduction, which is sickeningly enthusiastic about football, and a tendency to tell us far too much about players, pundits, teams and managers that mean nothing to me, I would have given the book five stars. Even the football-oriented parts can be engaging to the non-fan. I don't care if Manchester City is better than Liverpool and I have no idea who Messi is, but when Sumpter abstracts from overpaid individuals and team loyalties, there is some distinctly interesting stuff about, for instance, patterns of flow on the pitch or the way a Mexican wave travels around a stadium. And there was certainly amusement to see that one of the football 'experts' Sumpter criticises predicted that Leicester would be relegated from the premier league in 2015/16, when, just before the book was published, they ended up as champions. I also found Sumpter's last section really engaging. Here, he spends some time on an experiment to see if the effective use of data and mathematical models can make betting on football games more of a science than an art. Sumpter stresses that gambling is potentially dangerous and that the bookies make sure they come out on top overall - but he demonstrates that with the right mathematical approach you can possible beat the system by a few percentage points. There's almost a feel of the TV series Hustle about this attempt to take on the bookies and beat them at their own statistical game - and Sumpter puts his money where his mouth is, staking the advance for this book (at least, a part of his advance, or he was ripped off by his publisher). 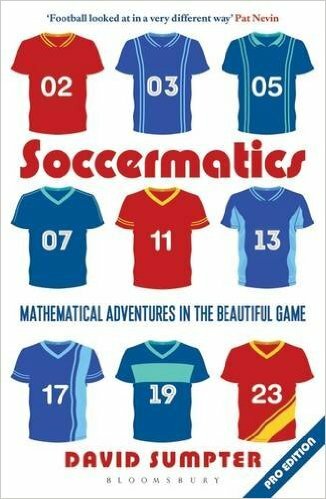 Did reading Soccermatics turn me into a football fan? Absolutely not. I can see the point of enjoying a kick around, but I can't understand why anyone finds football or footballers interesting. However, Sumpter's book has persuaded me that there is a lot more to running a football team than herding musclebound athletes - that, in principle at least (it's not obvious how much teams actually apply these methods) mathematical models can improve team tactics and result in better performance - and that mathematical modelling can be just as interesting when applied to the football pitch as it is when used to analyse the movements of a flock of birds or a shoal of fish. There may have been a few small sections I had to skip over, when I felt that Sumpter was getting too carried away with his obvious love of the game, but mostly, as the subtitle hints, I enjoyed my mathematical adventures in the 'beautiful' game.